Bruce Wayne has given in. In a desperate attempt to level the playing field against the Grim Knight and the Batman Who Laughs, Batman has given in to the poison inside of him. After losing Commissioner Gordon to the Grim Knight, Alfred found Bruce in the cave, wearing a visor exactly like the one worn by the Batman Who Laughs. Is this the end of the Dark Knight? Under Gotham, the Batman Who Laughs confesses to Jim that, on his world, he was his best friend. He explains to him that before his death, Joker killed hundreds of people, including other villains. However, despite that, Gordon still wanted to bring him in by the book. Unfortunately, Jim opened his notebook to find it spring-loaded with acid. By the time Batman realized what was happening, Jim was already dead. He tells Jim that if it hadn’t been for that, he probably wouldn’t have killed Joker, and the Batman Who Laughs never would have been born. He tells Jim that he needs six canisters of his serum to recreate the city, and he already has four. Jim spits out the rag in his mouth and tells him that despite everything he thinks he is, he’s just another criminal for the real Batman to put away. As the real Batman drives through the city, he can see the energy of everyone in Gotham, and of the city itself. He then gets a call from James Gordon Jr, who confirms that the Grim Knight is using the city’s power grid to draw power towards dark metal hotspots around the city to create portals. He also tells Batman that he believes the act of killing someone doesn’t lead to the slippery slope, it’s how you see that action that determines where the slope is. When Batman tries to hang up on him, James quickly asks, “But even when you win, in case you can’t stop what’s happening to you…Do you have a failsafe?” Batman doesn’t answer and proceeds to the resource compound below Gotham. Once there, he tests the water to make sure there is no contamination. However, he is met there by the Joker. Despite being attacked by Batman, Joker doesn’t want to fight. He tells Batman that in spite of their war against each other, he doesn’t want either of them to win. He then wishes Batman good luck. Batman stops him and begins to ask what Joker will do if he turns into the Batman Who Laughs. Joker replies, “Oh, I’ll blow your *$@%$#%# head off.” In a truly uncomfortable moment, the two of them sit there and share a laugh. Batman is drawn to Blackgate prison by a surge of dark energy. There, he runs into an officer who believes him to be the Batman Who Laughs. However, Batman quickly earns the officer’s trust, and they begin looking for an inmate together. Unfortunately, as Batman moves forward, the dark energy sends him into another universe where he runs into Warden Bruce Wayne of Blackgate Prison. At the same time, the Grim Knight cuts Gordon loose, telling him, “You hunted me on my world. I’m going to hunt you on yours…Now go. Run, Jim. Run.” In the prison, Batman and Warden Wayne are pulled back to the main universe in time for guards to start swarming. Batman drops a few smoke pellets but is separated from Warden Wayne by the officer that was helping him. The officer then pulls a knife and slices through Wayne’s throat. As Batman demands to know why he killed Wayne, we see Jim running through the sewers before being attacked by three of the Batman Who Laugh’s rabid Robins. They jump on him and begin to take bites out of his hand and shoulder. At the same time, near the water system we saw Batman at earlier, James is seen removing his hat and holding what looks to be his pill bottle. While this is happening, the officer tells Batman, “…You’re trying to see things through the eyes of your Robins, aren’t you? The eyes of your so-called children…for the first time ever, you’re looking at Gotham through the eyes of your real child…your truest child…the Batman Who Laughs. In other words…me.” The guard removes his helmet and reveals the scarred, deformed and twisted face of the Batman Who Laughs. He quickly puts the helmet back on and orders the guards inside Blackgate to open fire, covering Batman in a sea of bullets. Well that was uncomfortable. Not only did we see Jim Gordon literally being eaten alive, we finally saw the true face of the Batman Who Laughs. As before, it seems that no matter what Batman does, he’s so far behind the Batman Who Laughs that he’ll never catch up. This feels more and more like a losing battle, but I think that Batman’s advantage may come from an unexpected source. I’m starting to get a feeling that James will sacrifice himself to stop the Batman Who Laughs. Regardless of how it’s done and how this plays out, ending this fight will extract a heavy toll from all involved. 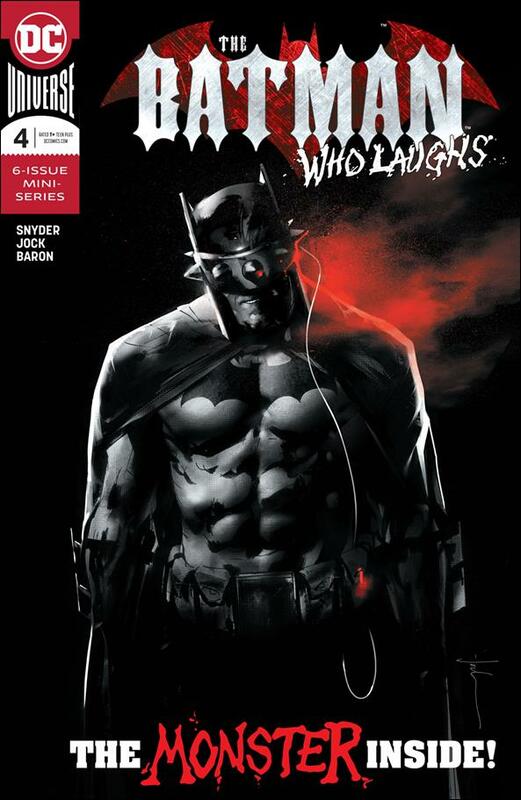 Unfortunately for all of Gotham, it seems that truly, a Batman Who Laughs is a Batman who wins.